I have this little sabre saw which has been kicking around for many years. I believe it came from my grandfather's house. It runs like a champ, no variable speed, just an on and off switch. I would love to hear any information about it. 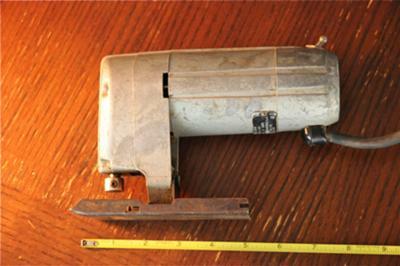 The metal tag on the underside belly reads: SEARS SABRE SAW-Develops Over 1/8 H.P.-115 VOLT A.C.-D.C.-1.8 AMPS-MODEL 315.6635- Tag Reads 5317-MADE IN U.S.A.-SEARS,ROEBUCK AND CO.-SIMPSONS-SEARS LTD. It's a cool little saw once you get used to an on/off switch only! I have upgraded and would love to see it end up in someone's vintage collection. U also have one same modal, works great. I wonder what year it is? I was thinking early 1900s? Ha, I just bought this exact saw at a garage sale for $5. Didn't even haggle over the price. I look foreword to using! I have an identical saw. What happened to yours? Did you find a buyer?